Varadkar’s comments on homelessness are unproven, visibly uninterested, and frankly unsettling. Homelessness and housing is the biggest hot-button topic in Irish politics right now and so, when high ranking officials comment, we all pay attention. However, Leo Varadkar’s recent remarks at a party conference in Cavan saying that Ireland had one of the lowest rates of homelessness by international standards should be treated with both scepticism and scrutiny. Our Taoiseach’s comments join a long list of homeless crises rejection by Irish politicians. From Conor Skehan, chair of the Housing Agency calling Irish homelessness “completely normal” to the Junior Minister for Housing Damien English worrying that media coverage was “damaging to Ireland’s international reputation.” How can we trust an official who seems unable to take matters seriously? Varadkar’s observations were unproven for one; the two reports used to back up his statement, one provided by the Housing Department and the other by the Government Press Office, both failed to include people living in direct provision, in domestic violence centres, people staying in prisons and hospitals without a home to return to and the ‘hidden homeless’, those staying temporarily with family and friends or doubled up in bedrooms. 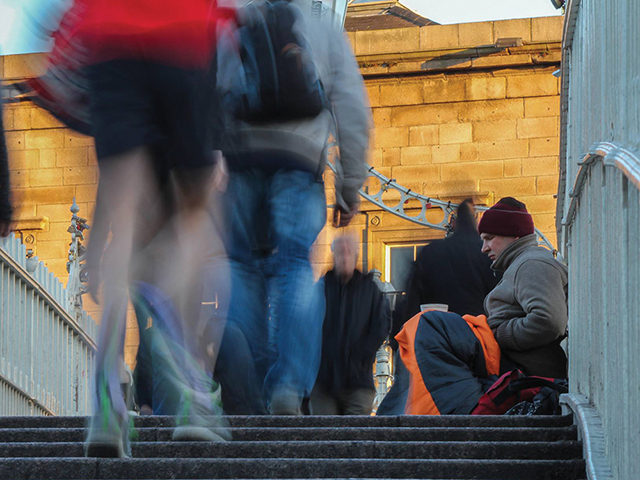 The problem is that Ireland only classifies homelessness under three categories: those living rough, those in emergency accommodation and those living in accommodation designed for the homeless. These are just three categories out of six used by the European Typography of Homelessness (ETHOS) which countries such as Denmark, Finland, and Sweden all use. Recent surveys found that Ireland currently has around 8,400 homeless, including over 3,100 children. However, if we were to use the same classification as other countries, Thejournal.ie found our number of homeless could be over 17,000. This is a great example of an Irish reaction to crises. To sweep trouble under the rug and pretend that the issue isn’t as big a problem that it really is. Move along, nothing to see here. Blame the individual, not the institution. Fault the beggar freezing on the street Christmas Day, not the government. For he is obviously there by his own volition. Even Eileen Gleeson of the Dublin Region Homeless Executive seems to support this notion: “Let’s be under no illusion here, when somebody becomes homeless it doesn’t happen overnight, it takes years of bad behaviour probably, or behaviour that isn’t the behaviour of you and me.” Varadkar’s comments like Gleeson’s shows his misunderstanding of the issue, his disinterest in the problem, his aloofness to lower class issues. His overall classism and elitism, as members of the Simon community and rival politicians have already pointed out. We should not be surprised when officials with backgrounds like Varadkar fail to look past the figures and see the faces of those affected. Putting it bluntly, either his comments were poorly researched to make himself look better, or it shows apathy towards the problem. I do not know which of is more worrying. Comments like these are a recipe for disaster, so remember to take them with a pinch of salt.